#MeToo. #TimesUp. The world over, women have been standing up and sharing their stories of abuse at the hands of powerful men. It isn’t the first time women have risen up but there is a difference this time. These women’s voices are being heard and amplified by thousands of others through social media and the accused men are being taken to task. But, let’s not celebrate yet. We still have a fight on our hands. 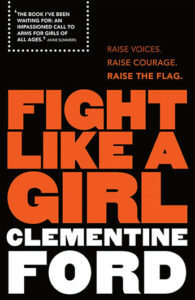 Clementine Ford’s Fight Like A Girl is aptly named. For centuries, being anything “like a girl” was considered an insult. It has taken years of hard work, from the suffragette movement to the early feminists, to now, for humanity to come even close to reclaiming the word “girl.” Why is that? And how exactly does one fight like a “girl”? By sharing moments from her own life, Ford illustrates how and why women—and this definitely includes transwomen and non-binary people—have been oppressed. “Girls are raised to believe that the most important thing we can be is pretty,” writes Ford. The placing of such unrealistic expectations on young girls isn’t hammered in so much as “kneaded into the fabric of our identities.” And, if women can’t be patriarchy’s narrow view of “pretty,” they are diminished and erased, no matter their other outstanding qualities. It is because of this retribution that so many women are afraid to call themselves feminists, even though, as Ford writes, feminism changed her negative attitude towards herself. “It taught me that my thoughts and feelings were real” [emphasis Ford’s]. But, feminists are often labelled “fat” and “ugly,” and no woman wants to be that because the patriarchy would deem them unworthy of male attention, and that’s all that counts, right? Ford dips into her experiences with these exact terms, laying out in painful detail how the fear of being fat led to a debilitating eating disorder, which continues to affect girls and women around the world. She writes about how her struggle with her “unconventional” features led to her difficult relationships with fellow women who she believed she needed to envy and bring down. If Ford would have had the knowledge she has now, she would have known how to fight these unfounded fears. As Ford writes, being a girl in this world hurts, and feminism is here to help girls exist without hurting. Ford’s Fight Like A Girl tells us how to do that. The experiences she lays out in this book will hit close to home and make you angry, so I suggest taking a few breaks between chapters to calm yourself. Fortunately, Ford also has a balm for the ache of rage you will feel. Unlike books that simply detail the various forms of oppression and abuse that women face, Ford gives the reader solutions. This is the kind of book that will inform and educate you, but it will also arm you with the tools to avenge yourself and others who are marginalised. Is society making you hate your body? Find something your body does well and keep doing that. Trolls sending you hateful messages? Share it with the world and laugh at their pettiness. Where Ford really turns the screw is in her discussion about abortion. She spends a few chapters of the book sharing her experience with abortion and examining the importance of safe abortion access for women. However, Ford does make it a point not to share the reasons behind having an abortion, insisting that it doesn’t matter to anyone but the woman involved why she chose to have an abortion. Her words couldn’t be more timely. In late July, Cricket Australia fired a woman for tweeting about having an abortion. These conversations need to be had right now. What I liked about Ford’s writing is that she is ready to question herself as well as others. She clearly acknowledges her white-passing and straight-passing privilege, and that she is striving to learn more and better understand how to elevate those even more marginalised than herself. Too many white feminists have excluded women of colour and transwomen in their conversations and compound the issue by refusing to be questioned about their exclusionary role in the movement. One can’t help but wish that they had had access to this book as teenagers, because it prepares you to tackle the world we live in now. Everyone, regardless of their gender, would benefit from reading Fight Like A Girl. For women and girls, the experiences contained in these pages will seem familiar, but the methods to deal with them will be new. For men and boys, this book will act as an eye-opener, not just because of what Ford has written but how she has written it. By incorporating the language used against her, often several times in succession, she successfully hammers home just how constant the barrage of abuse against women is. 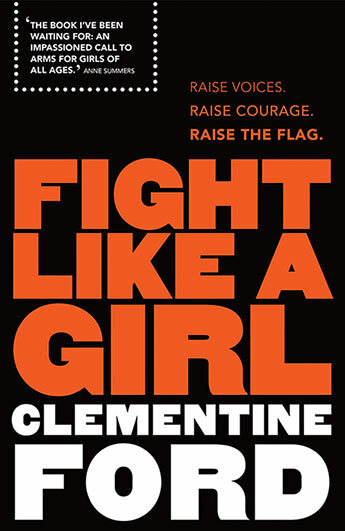 But what really makes Fight Like A Girl a great book to read is that it is so accessible. Ford’s tone of voice is conversational, and she directs the book to you, the reader. Despite the one-sided nature of books, it often feels like Ford isn’t as much talking at you, as with you. It is what makes this book a page-turner, even though the horrors within will make you shrivel up inside. Fight Like A Girl is not a diatribe but a declaration. Ford isn’t simply outlining the wrongs in the world and the men that compound it; she is declaring that these wrongs can and will be righted. The marginalised have been told to keep quiet, to let things slide, to let the people in power fix the problems. Ford is having none of it. She believes that to change the world the marginalised need to speak louder, push harder, be selfish, do what they tell you not to do because that is how you win like a girl.